I'm not vegan, but I made this and loved it. Used basil for the fresh herb called for (dill, basil or tarragon are suggested). Easy to make with the Vitamix...didn't have to do the extra soaking step. Will make again. Made this again and tried the Pesto Ranch variation. I omitted the clove of garlic as the pesto already had fresh garlic in it. Used fresh pesto from Woodlands Market. Added a couple spoonfuls of sour cream. Very good! It's thick enough to use as a dip for veggies. Excellent taste, but was too liquid. Had to add more oil to make it more dressing-like. These have an excellent flavor and I have to say they are addictive. I roasted them the longer time specified (18 minutes) and I had the required sticky glaze. Delicious, crunchy topping. Had to roast the almonds much longer than indicated to get the desired sticky glaze. Very good just as a snack as well. Excellent, very little active time needed. Had to substitute maple syrup for light molasses. Will make again not only as a salad topping. This is excellent like everything I have tried from this book so far! Omitted the Sriracha & Smoke Pecans because of husband's nut allergy, added some grilled white asparagus and topped it with a poached egg each to make it more substantial. Yum! On a sidenote, I find it really irritating when the picture in a cookbook shows an ingredient that is not part of the recipe, in this case the oranges. Loved the sweetness from the blueberries together with the gingery tofu and the crunchy almonds. Used baby salad greens instead of baby spinach. If preparing tofu and almonds ahead of time a very quick salald. This was good. The blueberries with the cucumbers and greens (I used a spicy baby salad blend) worked well with the salty and savory dressing (I used shichimi and it was good here). I made this as a side salad and didn't include the tofu- you don't need all of the dressing if you aren't serving it with tofu. Great combo of flavours and textures. My sriracha was quite hot and a bit overpowering. Next time I'll marinade the red onion for a little while as it was very pungent and disrupted the balance. I didn't rate this because I made a different pad thai sauce for it (wanted some fish sauce) that ended up being a bit muted in flavor. I reduced the noodles to 3 oz, the peanuts to 2 T, and used 1/2 lb tofu (which I made the night before). For the asparagus, I measured out a 1/2 pound after snapping off the tough ends, and used a mandoline instead of a y-shaped peeler. Good salad, but a lot of work....not sure if I'd make it again. Also, the lemongrass tofu was not super flavorful. I was surprised at how much we all enjoyed this. I am not a big asparagus fan, and I loved it. Good, but not as outstanding as the other recipes I have tried so far. Left out the dried figs, since I do not care much about them. In hindsight though the sweetness from the dried fruit would have probably added something special. Didn't enjoy this at all! the flavours simply don't work together. I thought this was a really great salad. If you're planning on eating it right away, I would reduce the orange juice a bit as it seemed a bit damp. But by the next day all the liquid had been absorbed. I substituted dried nectarines when peaches and nectarines weren't in season - not as good as the fresh fruit, but still very tasty. I have made this multiple times and everyone loves it. I put the peaches under the broiler since I don't have a grill. Very delicious. Cut chipotle chile powder by half. I mixed the chile powder in with the cut corn, but could probably add right into dressing. For picky eaters, have everyone add their own tomato and avocado. A definite keeper, hubby went back to lick the bowl. 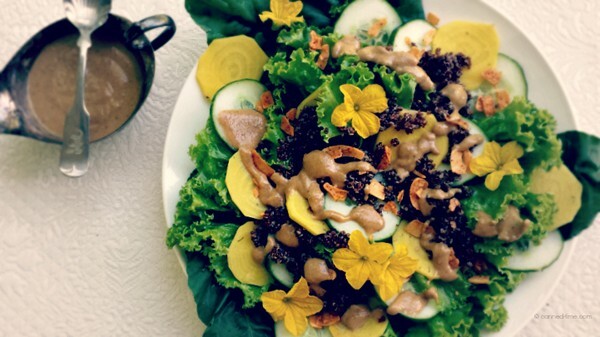 The creamy lime dressing by itself is worth trying this recipe. Excellent way to use fresh corn in season! Everyone who tried this became addicted to the chickpeas. I sautéed the Brussels sprouts and cooled them slightly before adding to the salad mix, love the recipe. Page 115 and 29 (dressing) in the UK Edition. What an amazing way to use Brussels Sprouts (I love them anyway except overcooked!) but to add grilled miso marinated apples to the mix is inspired. The Miso Dressing would be delicious on any salad I think, a real keeper. I love this book and everything I've tried so far has been incredible. The photography is lip smackingly beautiful the recipes easy to follow plus the notes accompanying many recipes are very helpful indeed. This is the only salad I've made from this book (and I've made a lot) that I didn't rate a five. I like the flavors, I think I would just prefer it all in a different format. 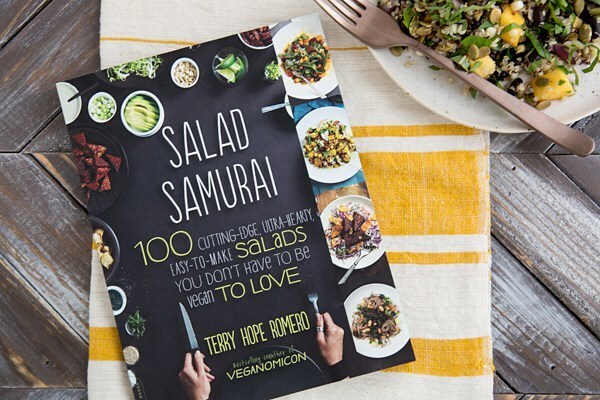 ...debunks the myth that salads are only the warm-up act with 100 hearty salad recipes that just happen to be vegan. Slippery noodles, creamy beans, crunchy walnuts, and perfectly evocative flavor combinations. Delicious. As coauthor of the bestselling vegan desserts series (including Vegan Cupcakes Take Over the World) and plant-based bible Veganomicon, and author of the go-to international cookbooks Viva Vegan! 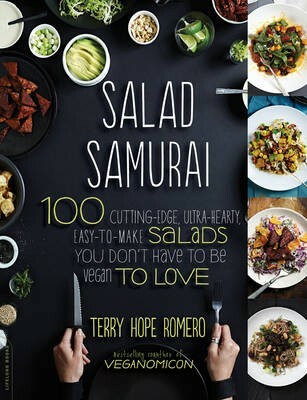 and Vegan Eats World, Terry Hope Romero knows her veggies. Now she’s turning to the new American staple: entreé salads. 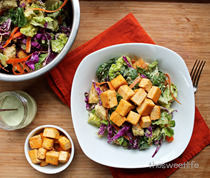 Salad Samurai invites you to dig in to the versatile world of meatless, dairy-free entrees built on whole-food ingredients. Salads aren’t just for warm months; Romero tackles meals based on seasonal ingredients, with recipes for fall (hazel nuts and roasted shiitake butter nut salad), winter (shaved fennel, clementine, pecan tempeh toss–up; gingery beets and lentils with tahini and date honey), spring (spring green sand peas in sassy rhubarb dressing; deconstructed spring quiche), and summer (East–West roasted corn salad; summer squash Pad Thai noodles). With sections devoted to brown–bagging it and work–friendly, kid–friendly, gluten–free, high–protein recipes loaded with superfoods, Romero shows you how to build killer salads that are satisfying, healthy, and scrumptious.